Research on cultural transmission and evolution just keeps on coming – so much so that I can hardly keep up! Great! For example, Andrew Whiten kindly drew my attention to a special issue of the Philosophical Transactions of the Royal Society B he co-edited with Robert Hinde, Kevin Laland and Christopher Stringer on the subject in April here. As well as an introduction by the co-editors titled “Culture evolves”, it includes 24 other reviews and research articles (many, despite their labels, are in substance a mixture of both.) 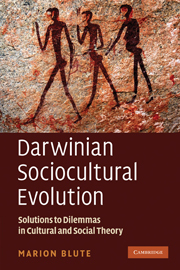 The stated objective is to emphasize “important linkages between culture and evolutionary biology rather than quarantining one from the other”. The first eight papers are about social learning in animals – its economics, in fish, birds, mammals particularly meerkats, capuchin monkeys, chimps, and two on the relationship between social learning and other aspects of intelligence. These are followed by four papers on the evolution of stone tools, eight on diverse other aspects of cultural evolution in humans including archaeology, linguistics, politics and experimental social psychology for example and ending back where we began in a sense with four more papers focusing on social learning, but now in modern humans, particularly children. This is a very rich resource which I recommend highly for professionals and students alike.